Last week in my article about bicycle laws in Japan I pointed out that while bicycle laws do in fact exist, they are rarely if ever enforced. Friday evening, while commuting home from the office, my theory of unenforced bicycle laws had a rather spontaneous test in a real world scenario. The results of which support my theory that police turn a blind eye to cyclists breaking the rules. Not far from the office on my nightly commute there is a 'T' intersection which operates on timed traffic signals, so regardless of the traffic conditions the lights change at regular, and thus predictable, intervals. Now, imagine me crossing the top of the 'T' left to right, against a red light, on the left hand side of the road as is custom in Japan. By glancing right as I slow, but before entering the intersection, I can see if any cars heading my way and determine if it is safe to cross the intersection. Safe as it is, I am always nervous as I run this red light as there is a koban (police box) on the corner which is staffed by 2 officers 24 hours a day. Efforts to make myself highly visible to motorists including a bright orange jacket, meters of reflective tape, blinking lights, and possibly the only Down Low Glow in Tokyo also point me and my misdeeds out clearly to any policemen that happen to be in the area. Yes I'm a little sheepish, but I cross this intersection against the red light in this manner, in full view of the koban every single evening without fail. On Friday however a new variable was added to the equation. As a co-worker and myself approached the already red light we noticed a police pursuit car stopped at the intersection ahead of us, lights flashing, alerting everyone to its presence. After a short exchange my co-worker and I decided to proceed as usual. Passed the police car on the left, slowed, checked for traffic, then cranked our way through the intersection. One police pursuit car, 2 occupants, one police box, 2 occupants, two blatantly law breaking cyclists one lit up like a Christmas tree. I fully expected us to get busted. When we reached the intersection with Tamagawa Dori (Route 246) the light was red and we stopped accordingly as crossing 246 dangerous enough on a green light let alone a red one. The police car, with its lights still flashing, slowly pulled up behind us and came to a stop at which point I expected an officer to get out and give us a stern talking to. Therefore I conclude that my theory that bicycle laws in Japan will go unenforced unless you cause an accident injuring someone other than yourself, is sound. Having concluded this I don't want to encourage you to put this theory to the test, but as always simply exercise some common sense and ride safely when on the streets of Tokyo. Is it just Tokyo where the police are disinterested in enforcing cycling laws or is it like this all around Japan? 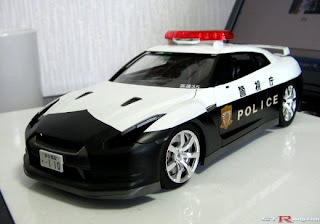 Well, from that I have noticed the fuzz in Tokyo only enforce `the law` when someone complains or when enough people are involved. Other than that, they really do not give a damn what happens. Isn't it just another difference between a philosophy of shame and a philosophy of guilt? During 5 years of riding in Yokohama, the only times I have only been hassled by the police was during last November`s APEC economic conference. Lately, I have been riding a Yuba Mundo cargo bike around together with my two sons (5 and 8), and occasionally even my wife, seated on the back rack. The police usually stare (with mouths agape) but I have yet to be stopped, although the 5 year old technically should be in a baby seat and the 8 year old on his own bike. You missed one big loophole. Japan automatically makes the injured party the victim. So when some old idiot on a poorly maintained cruiser runs you down, but they break their arm, it's going to be a year+ long battle to prove that you weren't at fault, and even then, you'll have to cover your own legal fees (300,000+) and they'll probably make you some percent liable, even if you weren't. So ride safe, take the lane, and stay away from other bicyclists. If there's a parked car, and then a mama-chari in a 4-lane road, it is absolutely the right thing to take the passing lane in order to keep yourself safe, and that honking taxi be damned.